Part I: The Initiation and Growth of Molecular Biology and Genomics – Part I From Molecular Biology to Translational Medicine: How Far Have We Come, and Where Does It Lead Us? Part II: CRACKING THE CODE OF HUMAN LIFE is divided into a three part series. Part IIA. “CRACKING THE CODE OF HUMAN LIFE: Milestones along the Way” reviews the Human Genome Project and the decade beyond. Part IIB. 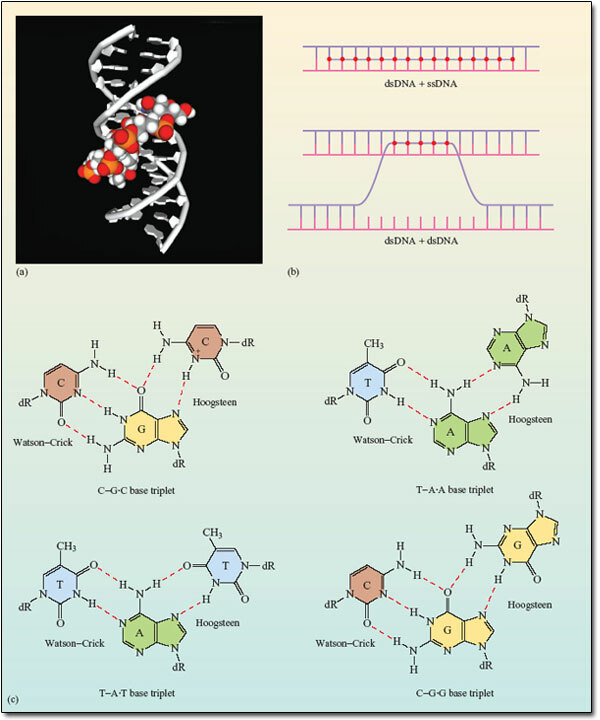 “CRACKING THE CODE OF HUMAN LIFE: The Birth of BioInformatics & Computational Genomics” lays the manifold multivariate systems analytical tools that has moved the science forward to a groung that ensures clinical application. Part IIC. “CRACKING THE CODE OF HUMAN LIFE: Recent Advances in Genomic Analysis and Disease “ will extend the discussion to advances in the management of patients as well as providing a roadmap for pharmaceutical drug targeting. potential therapeutic targets for reversal of the process. developments in applied mathematics have transformed the research framework. Sexton T, Yaffe E, Kenigeberg E, Bantignies F,…Cavalli G. Institute de Genetique Humaine, Montpelliere GenomiX, and Weissman Institute, France and Israel. Cell 2012; 148(3): 458-472. Chromosomes are the physical realization of genetic information and thus form the basis for its readout and propagation. a modified genome-wide chromosome conformation capture approach applied to Drosophila embryonic nuclei. the entire genome is linearly partitioned into well-demarcated physical domains that overlap extensively with active and repressive epigenetic marks. Chromosomal contacts are hierarchically organized between domains. active domains reach out of the territory to form remote intra- and interchromosomal contacts. specific long-range intrachromosomal contacts between Polycomb-repressed domains. laying the foundation for detailed studies of chromosome structure and function in a genetically tractable system. how different genetic sequences contribute to health and disease. But these studies miss a key element of the genome—its spatial organization—which has long been recognized as an important regulator of gene expression. 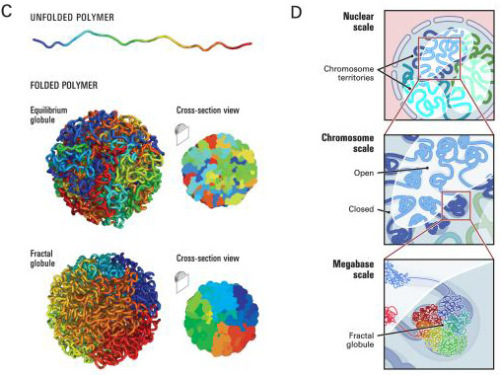 how distant chromosome locations interact inside a nucleus. The creation and function of 3-D genome organization, some say, is the next frontier of genetics. creating a reasonably comprehensive genome map is quicker and cheaper than sequencing the entire genome. mapping involves less information to collect and organize than sequencing does. address the ethical, legal, and social issues (ELSI) that may arise from the project. Though the HGP is finished, analyses of the data will continue for many years. By licensing technologies to private companies and awarding grants for innovative research, the project catalyzed the multibillion-dollar U.S. biotechnology industry and fostered the development of new medical applications. 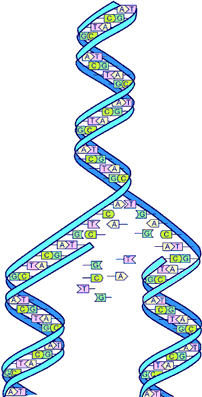 When genes are expressed, their sequences are first converted into messenger RNA transcripts, which can be isolated in the form of complementary DNAs (cDNAs). 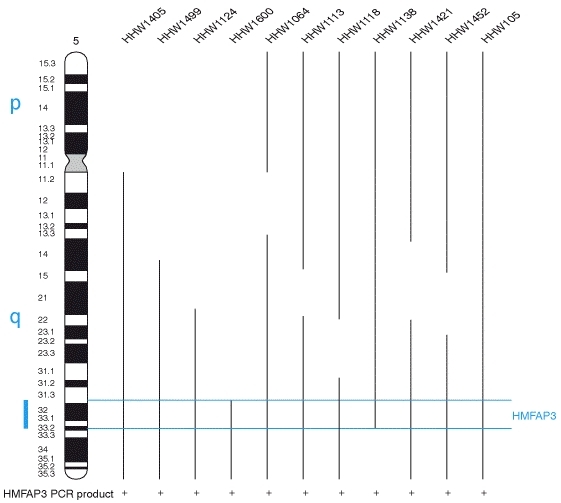 A small portion of each cDNA sequence is all that is needed to develop unique gene markers, known as sequence tagged sites or STSs, which can be detected using the polymerase chain reaction (PCR). To construct a transcript map, cDNA sequences from a master catalog of human genes were distributed to mapping laboratories in North America, Europe, and Japan. These cDNAs were converted to STSs and their physical locations on chromosomes determined on one of two radiation hybrid (RH) panels or a yeast artificial chromosome (YAC) library containing human genomic DNA. This mapping data was integrated relative to the human genetic map and then cross-referenced to cytogenetic band maps of the chromosomes. (Further details are available in the accompanying article in the 25 October issue of SCIENCE). Tremendous progress has been made in the mapping of human genes, a major milestone in the Human Genome Project. Apart from its utility in advancing our understanding of the genetic basis of disease, it provides a framework and focus for accelerated sequencing efforts by highlighting key landmarks (gene-rich regions) of the chromosomes. The construction of this map has been possible through the cooperative efforts of an international consortium of scientists who provide equal, full and unrestricted access to the data for the advancement of biology and human health. There are two types of maps: genetic linkage map and physical map. The genetic linkage map shows the arrangement of genes and genetic markers along the chromosomes as calculated by the frequency with which they are inherited together. The physical map is representation of the chromosomes, providing the physical distance between landmarks on the chromosome, ideally measured in nucleotide bases. Physical maps can be divided into three general types: chromosomal or cytogenetic maps, radiation hybrid (RH) maps, and sequence maps. 2B. Genome-nuclear lamina interactions and gene regulation. Kind J, van Steensel B. Division of Gene Regulation, Netherlands Cancer Institute, Amsterdam, The Netherlands. large genomic domains that are in contact with the lamina. the lamina can actively contribute to this repression. Furthermore, the lamina indirectly controls gene expression in the nuclear interior by sequestration of certain transcription factors. Peric-Hupkes D, Meuleman W, Pagie L, Bruggeman SW, Solovei I, …., van Steensel B. Division of Gene Regulation, Netherlands Cancer Institute, Amsterdam, The Netherlands. affects many genes that determine cellular identity. others, remain inactive yet become unlocked for activation in a next differentiation step. lamina-genome interactions are widely involved in the control of gene expression programs during lineage commitment and terminal differentiation. view the full text on ScienceDirect. Authors: Daan Peric-Hupkes, Wouter Meuleman, Ludo Pagie, Sophia W.M. Bruggeman, et al. a manner of crumpling without knotting. In the last 3 years, Jobe Dekker and others have advanced technology even further, allowing them to paint a more refined picture of how the genome folds—and how this influences gene expression and disease states. Dekker’s 2009 findings were a breakthrough in modeling genome folding, but the resolution—about 1 million base pairs— was too crude to allow scientists to really understand how genes interacted with specific regulatory elements. The researchers report two striking findings. while sequestering unused DNA in a denser storage compartment. as their DNA alternates between active, gene-rich and inactive, gene-poor stretches. genes and regulatory elements associate more often with one another than with other chromosome sections. what determines which elements are looped into proximity. Lieberman-Aiden, van Berkum, Lander, and Dekker’s co-authors are Bryan R. Lajoie of UMMS; Louise Williams, Ido Amit, and Andreas Gnirke of the Broad Institute; Maxim Imakaev and Leonid A. Mirny of MIT; Tobias Ragoczy, Agnes Telling, and Mark Groudine of the Fred Hutchison, Cancer Research Center and the University of Washington; Peter J. Sabo, Michael O. Dorschner, Richard Sandstrom, M.A. Bender, and John Stamatoyannopoulos of the University of Washington; and Bradley Bernstein of the Broad Institute and Harvard Medical School. Lieberman-Aiden et al. 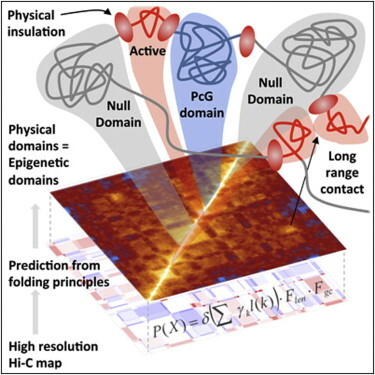 Comprehensive mapping of long-range interactions reveals folding principles of the human genome. Science, 2009; DOI: 10.1126/science.1181369. The mapping technique that Aiden and his colleagues have come up with bridges a crucial gap in knowledge—between what goes on at the smallest levels of genetics (the double helix of DNA and the base pairs) and the largest levels (the way DNA is gathered up into the 23 chromosomes that contain much of the human genome). The intermediate level, on the order of thousands or millions of base pairs, has remained murky. As the genome is so closely wound, base pairs in one end can be close to others at another end in ways that are not obvious merely by knowing the sequence of base pairs. Borrowing from work that was started in the 1990s, Aiden and others have been able to figure out which base pairs have wound up next to one another. From there, they can begin to reconstruct the genome—in three dimensions. Eric Lander (Science Adviser to the President and Director of Broad Institute) et al. delivered the message on Science Magazine cover (Oct. 9, 2009) and generated interest in this by the International HoloGenomics Society at a Sept meeting. First, it may seem to be trivial to rectify the statement in “About cover” of Science Magazine by AAAS. The statement “the Hilbert curve is a one-dimensional fractal trajectory” needs mathematical clarification. The mathematical concept of a Hilbert space, named after David Hilbert, generalizes the notion of Euclidean space. It extends the methods of vector algebra and calculus from the two-dimensional Euclidean plane and three-dimensional space to spaces with any finite or infinite number of dimensions. A Hilbert space is an abstract vector space possessing the structure of an inner product that allows length and angle to be measured. Furthermore, Hilbert spaces must be complete, a property that stipulates the existence of enough limits in the space to allow the techniques of calculus to be used. A Hilbert curve (also known as a Hilbert space-filling curve) is a continuous fractal space-filling curve first described by the German mathematician David Hilbert in 1891, as a variant of the space-filling curves discovered by Giuseppe Peano in 1890. For multidimensional databases, Hilbert order has been proposed to be used instead of Z order because it has better locality-preserving behavior. The Hilbert Curve can be expressed by a rewrite system (L-system). Here, F means “draw forward”, – means “turn left 90°”, and + means “turn right 90°” (see turtle graphics). While the paper itself does not make this statement, the new Editorship of the AAAS Magazine might be even more advanced if the previous Editorship did not reject (without review) a Manuscript by 20+ Founders of (formerly) International PostGenetics Society in December, 2006.
the “strand” can be accessed only at its beginning – it is impossible to e.g. to pluck a segment from deep inside the “globulus”. but provides an easy access to “linearly remote” segments of the strand. if the Hilbert-curve is measured by the Euclidean distance along the zig-zagged path. Likewise, even the path from the beginning of the Hilbert-curve is about equally easy to access – easier than to reach from the origin a point that is about 2/3 down the path. 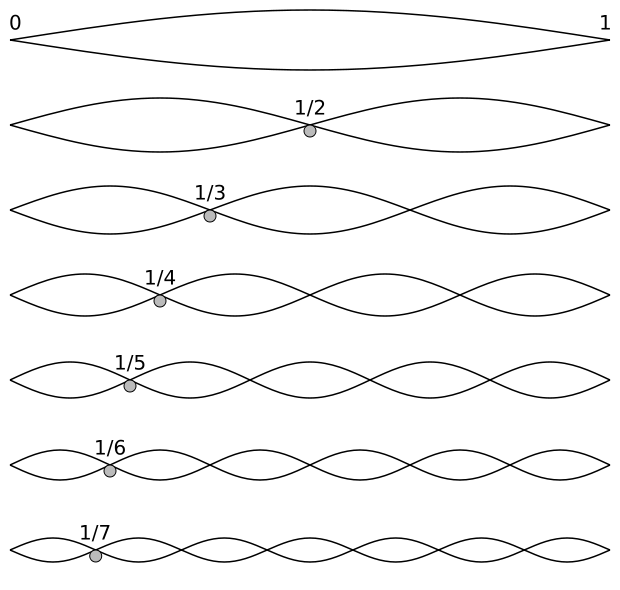 The Hilbert-curve provides an easy access between two points within the “spooled thread”; from a point that is about 1/5 of the overall length to about 3/5 is also in a “close neighborhood”. that various segments can be easily accessed. Moreover, in a way that distances between various segments are minimized. This marvellous fractal structure is illustrated by the 3D rendering of the Hilbert-curve. Once you observe such fractal structure, you’ll never again think of a chromosome as a “brillo mess”, would you? It will dawn on you that the genome is orders of magnitudes more finessed than we ever thought so. Those embarking at a somewhat complex review of some historical aspects of the power of fractals may wish to consult the ouvre of Mandelbrot (also, to celebrate his 85th birthday). For the more sophisticated readers, even the fairly simple Hilbert-curve (a representative of the Peano-class) becomes even more stunningly brilliant than just some “see through density”. Those who are familiar with the classic “Traveling Salesman Problem” know that “the shortest path along which every given n locations can be visited once, and only once” requires fairly sophisticated algorithms (and tremendous amount of computation if n>10 (or much more). Some readers will be amazed, therefore, that for n=9 the underlying Hilbert-curve helps to provide an empirical solution. Briefly, the significance of the above realization, that the (recursive) Fractal Hilbert Curve is intimately connected to the (recursive) solution of TravelingSalesman Problem, a core-concept of Artificial Neural Networks can be summarized as below. “Perceptions were modeled chiefly with neural connections in a “forward” direction: A -> B -* C — D. The analysis of networks with strong backward coupling proved intractable. All our interesting results arise as consequences of the strong back-coupling” (Hopfield, 1982). represent neural networks under the governance of DNA information). means humans have just one-third more genes than a common species of worm. The term was coined to describe similar but not completely identical repetitive sequences of amino acids (the same substances that make genes), which appeared to have no function or purpose. The main theory at the time was that these apparently non-working sections of DNA were just evolutionary leftovers, much like our earlobes. If biophysicist Andras Pellionisz is correct, genetic science may be on the verge of yielding its third — and by far biggest — surprise. With a doctorate in physics, Pellionisz is the holder of Ph.D.’s in computer sciences and experimental biology from the prestigious Budapest Technical University and the Hungarian National Academy of Sciences. A biophysicist by training, the 59-year-old is a former research associate professor of physiology and biophysics at New York University, author of numerous papers in respected scientific journals and textbooks, a past winner of the prestigious Humboldt Prize for scientific research, a former consultant to NASA and holder of a patent on the world’s first artificial cerebellum, a technology that has already been integrated into research on advanced avionics systems. Because of his background, the Hungarian-born brain researcher might also become one of the first people to successfully launch a new company by using the Internet to gather momentum for a novel scientific idea. The genes we know about today, Pellionisz says, can be thought of as something similar to machines that make bricks (proteins, in the case of genes), with certain junk-DNA sections providing a blueprint for the different ways those proteins are assembled. The notion that at least certain parts of junk DNA might have a purpose for example, many researchers now refer to with a far less derogatory term: introns. In a provisional patent application filed July 31, Pellionisz claims to have unlocked a key to the hidden role junk DNA plays in growth — and in life itself. His patent application covers all attempts to count, measure and compare the fractal properties of introns for diagnostic and therapeutic purposes. To fully understand Pellionisz’ idea, one must first know what a fractal is. Fractals are a way that nature organizes matter. Fractal patterns can be found in anything that has a nonsmooth surface (unlike a billiard ball), such as coastal seashores, the branches of a tree or the contours of a neuron (a nerve cell in the brain). Some, but not all, fractals are self-similar and stop repeating their patterns at some stage; the branches of a tree, for example, can get only so small. Because they are geometric, meaning they have a shape, fractals can be described in mathematical terms. It’s similar to the way a circle can be described by using a number to represent its radius (the distance from its center to its outer edge). When that number is known, it’s possible to draw the circle it represents without ever having seen it before. everything from the wings of a fly to the entire body of a full-grown human. In a move sure to alienate some scientists, Pellionisz has chosen the unorthodox route of making his initial disclosures online on his own Web site. He picked that strategy, he says, because it is the fastest way he can document his claims and find scientific collaborators and investors. Most mainstream scientists usually blanch at such approaches, preferring more traditionally credible methods, such as publishing articles in peer-reviewed journals. Basically, Pellionisz’ idea is that a fractal set of building instructions in the DNA plays a similar role in organizing life itself. Decode the way that language works, he says, and in theory it could be reverse engineered. Just as knowing the radius of a circle lets one create that circle, the more complicated fractal-based formula would allow us to understand how nature creates a heart or simpler structures, such as disease-fighting antibodies. At a minimum, we’d get a far better understanding of how nature gets that job done. The complicated quality of the idea is helping encourage new collaborations across the boundaries that sometimes separate the increasingly intertwined disciplines of biology, mathematics and computer sciences. The human genome: a multifractal analysis. Moreno PA, Vélez PE, Martínez E, et al. 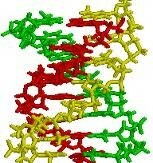 Background: Several studies have shown that genomes can be studied via a multifractal formalism. Recently, we used a multifractal approach to study the genetic information content of the Caenorhabditis elegans genome. Here we investigate the possibility that the human genome shows a similar behavior to that observed in the nematode. to a lesser extent on CpG islands and (G+C) content. In contrast, no or low relationship was found for LINE, MIR, MER, LTRs elements and DNA regions poor in genetic information. large gene families were located in genomic regions with varied multifractality. Additionally, a multifractal map and classification for human chromosomes are proposed. Alu elements in genome stability and structure of the human genome. these quantifications are especially useful. sequence identity between repetitive elements can vary significantly. discover repetitive elements within a larger genomic sequence. discovering the occurrence of repeats ab initio, per the user’s required sensitivity of the search. this may be an inappropriate metric for comparing data across different experiments. Here we propose an approach that addresses the above mentioned problem by the simultaneous testing and integration of the three hypotheses (contrasts) using the cell means ANOVA model. globally over all experimental groups. was driven by biological inference. while controlling for multiple hypothesis testing. 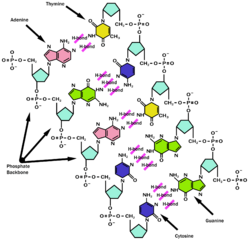 The complexity of biomolecular interactions and influences is a major obstacle to their comprehension and elucidation. Visualizing knowledge of biomolecular interactions increases comprehension and facilitates the development of new hypotheses. The rapidly changing landscape of high-content experimental results also presents a challenge for the maintenance of comprehensive knowledgebases. Distributing the responsibility for maintenance of a knowledgebase to a community of subject matter experts is an effective strategy for large, complex and rapidly changing knowledgebases. by crowdsourcing to promote the incorporation of current knowledge from the literature. will be facilitated by effective visualizations of the corresponding biomolecular interaction networks. as an effective visualization tool for systems biology research and education. flexibly visualize multi-molecule query results for heterogeneous interaction types across different orthologs. included protein-protein interactions in the database. provide an open-access database that can be downloaded as a whole. Most databases support web services for interacting with the database contents programatically, whereas this is a planned feature for Cognoscente. which we consider among the most important features for facilitating comprehension of query results. it does not score interactions to predict functional associations. Web services and support for small molecule interactants are currently under development. Than you for this marvelous article. Will it become Part IV and THE INTEGRATION or Should it The Introduction to this Series of three parts?? C.2 if this SIXETTE Should form Part ONE of the e-Book to follow the introduction to the e-Book. Aviva’s order for C.1, above. All wikipedia sourced IMAGES requires Permission from originators to be submitted to Amazon’s Kindle for inclusion in a commercial products, i.e., downloadable e-Books. Authors should find the sources.